A Catholic mother and her three children narrowly escaped being burned to death today following a loyalist attack. A traumatised Janette Nelson and her family escaped by climbing up onto an adjoining roof of the house in the early hours of this Friday morning. It was the third sectarian attack on their home in Newtownards, County Down, in the past month. Ms Nelson, who is 38, her two-year-old son and daughters aged seven and 12, were being treated for shock today but are otherwise unhurt. She said she was “terrified” as the thick, black smoke filled the property and said that if her smoke alarm hadn’t worked, her and her children could have been killed. “I was absolutely terrified and so were my children,” she explained. The family were woken by the alarm as heavy smoke filled the property after 2am. A neighbour was alerted to the fire and climbed onto a shed beside the house. Janette described waking up her young kids and bringing them to the bathroom at the back of the house. She said: “I was in bed and just jumped up. When I came out to the landing I felt this immense heat coming up the stairs and saw the front door was all in flames. “I lifted my son, who is only two, and a phone. Then I went into the girls’ room. I got them into the bathroom and called the police. The house has previously been targeted twice in recent weeks when graffiti was painted on the walls, windows were smashed and a car was damaged. Last week, the words ‘Taigs out’ [Catholics out] were daubed all over her home. Speaking at the time, single mother of three Janette said she couldn’t understand why she is being targeted. “We have lived here for a long time and we’ve not had any problems and it’s just heartbreaking,” she said. There is also long history of anti-Catholic violence in County Down. In 1920, more than 1,000 Catholic families across the county had their homes set on fire in a wave of unionist pogroms known as ‘The Burnings’. Last month, a Catholic home in west Belfast was petrol bombed by loyalists. 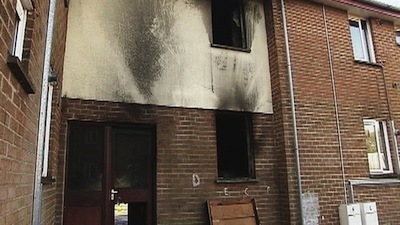 Also last month, there was an attempt to burn a Polish family out of their home in Glanarm in county Antrim. In 1998, three young children were murdered in a similar loyalist attack in Ballymoney. The boys -- Richard Quinn, 11, Mark Quinn, 9, and Jason Quinn, 7 -- were asleep in their beds when a petrol bomb was thrown through a window, and all three perished.